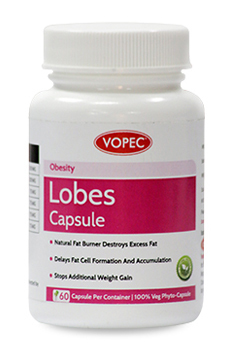 Lobes capsules are helpful to reduce excess weight without any side effects. Herbs in this formulation increases lipid metabolism, induces natural Cellular death of fat cells, inhibits formation of new fat cells and reduces excess weight. Lobes Capsules contain a potent blend of herbs for controlling weight gain without any adverse side effects. This formula controls excess weight by increasing fat metabolism and by breaking down deposited fat in the body. It slows down the formation of fat cells, induces natural destruction and elimination of fat cells and inhibits accumulation of excess lipids. The formula also regulates secretion of enzymes and hormones which are responsible for weight gain and greatly reduces metabolic imbalances that cause obesity. Lobes capsules have also shown to reduce cholesterol and maintain blood pressure at optimum levels. Take one to two capsules daily after meals or as directed by physician. Nutritional intake during a weight loss program is critical. If you are considering losing weight please consider using Spirupac Capsules. Cyperus rotundus (Musta) - Cyperus rotundus is commonly used in Aryurvedic medicine for treating fevers and digestive system disorders. A key benefit of this herb is that it stimulates lipolysis (breakdown of fats) and aids in reducing deposited body fat. Dolicus biflorus (Kulattha) - Dolicus biflorus commonly known as horse-gram is highly beneficial for lowering cholesterol (hypocholestremic) and fat (hypolipidaemic) and is also a diuretic. Ommiphora mukkul (Guggulu) - Commiphora mukkul has long been used in ayurvedic medicine as a highly effective treatment for obesity. Guggulipid and Guggulsterones obtained from the resin of Commiphora mukkul promotes lipolysis (breakdown of fats) and induces apoptosis (programmed destroying) of fat cells in the body. Allium sativum (garlic) Allium sativum or garlic increases adiponectin levels, a protein that aids fat metabolism, slows down formation of fat cells and inhibits accumulation of lipids in the body. A person can become obese when intake of food far exceeds the amount of food required by the body. This excess food causes fat deposition in the cells leading to weight gain. There are a number of factors that can contribute to the problem such as: genetics (your genes determine how your body works); metabolism (how your body turns food into energy - the calorie-in to calorie-out balance needs to be just right for the body's metabolism); eating habits (there are some eating patterns which are not helpful for weight control such as over eating, emotional eating, habitual eating etc); exercise habits (lack of regular exercise); lifestyle (too much stress, social situations that involve excessive calorie intake); hormonal imbalances (your hormones play an important role in weight control, that if they are deranged, weight gain results); environment (cultural approach to food, weight and exercise); psychological factors (eating helps people deal with stress, boredom, sadness, distressing thoughts etc). Is there any toxicity concern shown in the study of Lobes Capsules? Some herbal chemicals can induce mutations and can also be responsible for future mutations. Mutations are responsible for abnormal cell growth that could lead to toxicity and cancer. To test that there is no such effect, Lobes capsules have been subjected to comprehensive research study. Using analysis known as 'bacterial reverse mutation' method, Lobes capsules have been tested for mutagenicity, toxicity and carcinogenicity. The study showed that there was no significant finding for such toxicity. Cyperus rotundus L. (Cyperaceae; C. rotundus) is an Indian medicinal plant demonstrated to exert multiple health benefits. The purpose of the present study was to test the biological efficacy of C. rotundus tubers extract on weight control in obese Zucker rats. It was demonstrated that administration of 45 or 220 mg/kg/day of C. rotundus tubers hexane extract for 60 days in Zucker rats induced a significant reduction in weight gain without affecting food consumption or inducing toxicity. In vitro, 250 µg/mL of this extract was able to stimulate lipolysis in 3T3-F442 adipocytes suggesting that this medicinal plant contains activators of β-adrenoreceptors (AR). The binding assay performed on the rat β3-AR isoform, known to induce thermogenesis, demonstrated that C. rotundus tubers extract can consistently and effectively bind to this receptor. Result: These data suggest that the effect on weight gain exerted by C. rotundus tubers extract may be mediated, at least partially, through the activation of the β3-AR. In conclusion, C. rotundus tubers extract prove to be a new herbal supplement for controlling body weight preferentially in β3-AR sensitive species. Objective: This study was undertaken to evaluate the anti-obesity potential of the aqueous tuber extract of Cyperus rotundus L. (ATECR) in high fat cafeteria diet (HFCD) fed obese rats. Methods: Wistar strain of albino rats were divided into six groups comprising of six rats each. Group I served as normal control fed with normal pellet chow, group II served as disease control fed with high fat cafeteria diet, group III, IV and V animals, received ATECR at a dose level of 100, 200 and 300mg/kg bw along with HFCD for 40 days, while, group VI served as standard drug control, which received Orlistat at a dosage of 50mg/kg bw along with HFCD. Results: Administration of HFCD for 40 successive days to experimental rats significantly increased the body weight, organ and fat pad weights, serum total cholesterol, LDL cholesterol, VLDL cholesterol, triglycerides and glucose levels; and decreased HDL cholesterol as compared to normal control. While treatment with ATECR showed a significant reduction in the body weight gain, organ weight of the liver, kidney, spleen, weight of fat pads and the levels of serum triglycerides, total cholesterol, LDL cholesterol, VLDL cholesterol, glucose and increase in HDL cholesterol in a dose dependent manner. Further, the levels of liver markers such as aspartate transaminase (AST), alanine transaminase (ALT) and alkaline phosphatase (ALP), which were found to be elevated in the serum of obese rats, also resumed to normal on treatment with different concentrations of ATECR. Moreover, the consumption of ATECR reduced oxidative stress by enhancing the levels of glutathione (GSH), glutathione peroxidase (GPx), super oxide dismutase (SOD) and catalase in the hepatic tissue of rats with HFCD induced obesity. Conclusion: These results demonstrate clearly that repeated oral administration of tubers of Cyperus rotundus L. aqueous extract can evoke a potent anti-obesity activity. Objective: To determine the effects of guggulsterone (GS), the active substance in guggulipid, on apoptosis, adipogenesis, and lipolysis using 3T3-L1 cells. Methods and Procedures: For apoptosis and lipolysis experiments, mature adipocytes were treated with GS isomers. Viability, apoptosis, and caspase 3/7 activation were quantified using MTS, enzyme-linked immunosorbent assay (ELISA), caspase-Glo 3/7 activity assay, respectively. The expression of cytochrome c was demonstrated by western blot. Lipolysis was quantified by measuring the release of glycerol. For adipogenesis experiments, postconfluent preadipocytes were incubated with GS isomers for up to 6 days during maturation. Adipogenesis was quantified by measuring lipid content using Nile Red dye. Western blot was also used to demonstrate the adipocyte-specific transcription factors peroxisome proliferator–activated receptor γ2 (PPARγ2), CCAAT/enhancer binding protein α (C/EBPα), and C/EBPβ. Results: In mature adipocytes cis-GS decreased viability, whereas the trans-GS isomer had little effect. Both isomers caused dose-dependent increases in apoptosis and cis-GS was more effective than trans-GS in inducing apoptosis. cis- and trans-GS also increased caspase-3 activity and release of cytochrome c from mitochondria. In maturing preadipocytes, both isomers were equally effective in reducing lipid content. The adipocyte-specific transcription factors PPARγ2, C/EBPα, and C/EBPβ were downregulated after treatment with cis-GS during the maturation period. Furthermore, cis-GS increased basal lipolysis of mature adipocytes, but trans-GS had no effect. Discussion: These results indicate that GS isomers may exert antiobesity effects by inhibiting differentiation of preadipocytes, and by inducing apoptosis and promoting lipolysis of mature adipocytes. The cis-GS isomer was more potent than the trans-GS isomer in inducing apoptosis and lipolysis in mature adipocytes. Garlic and its organosulfur compounds display hypolipidemic effects by inhibiting fatty acid and cholesterol synthesis. We investigated the anti-adipogenic effect of diallyl trisulfide (DATS), the second most abundant organosulfide in garlic oil. We studied the effects of DATS in 3T3-L1 preadipocytes and the mechanism involved in its action. DATS (0–75 μM) inhibited CCAAT/enhancer-binding protein (C/EBP) α and β and peroxisome proliferator-activated receptor (PPAR) γ mRNA and protein levels in a dose- and time-dependent manner, leading to a decrease of fatty acid synthase (FAS) expression and lipid accumulation in 3T3-L1 cells. Insulin treatment induced a transient increase in ERK phosphorylation in 3T3-L1 preadipocytes, and maximal induction was observed at 5 min and then declined. DATS, however, sustained ERK phosphorylation up to 120 min. In the presence of PD98059, the phosphorylation of ERK and suppression of PPARγ expression and DNA binding activity of PPARγ by DATS were reversed, and lipid accumulation was restored. In conclusion, these results indicate that DATS inhibits the differentiation of 3T3-L1 preadipocytes into adipocytes. DATS is likely to act by prolonging ERK activation, which leads to the down-regulation of adipogenic transcription factor expression during adipogenesis. Result: Our results suggest that garlic may have potential as an anti-obesity agent. High fat diet fed rats showed significant increased levels of plasma and tissue total cholesterol, triglycerides, free fatty acids, phospholipids, plasma LDL cholesterol and decreased level of plasma H DL cholesterol. Methanolic extract o f D.biflorus administration to high fat diet fed rats showed near to normal levels of the above lipids in plasma and tissues. Higher dose of the extract (400 mg/kg body weight) showed comparable results with standard drug atorvastatin. Result: It is concluded that the methanolic extract of D. biflorus possesses hypolipidemic activity in high fat diet fed rats. Triphala and Its Constituents Ameliorate Visceral Adiposit y From a High-fat Diet in Mice With Diet-induced Obesity. Source: Alternative Therapies in Health & Medicine . Nov/Dec2012, Vol. 18 Issue 6, p38-45. 8p. Context In India, vaidyas (Ayurvedic physicians) traditionally administer triphala and its constituents as therapeutic agents for promoting digestion and satiety. Objective • The research team performed the present study to investigate the effects of triphala and its constituents (T bellirica [bibhitaki], T chebula [haritaki], and E officinalis [amalaki]) on the dietary induction of obesity (diet-induced obesity [DIO]), and other symptoms of visceral obesity syndrome, in mice fed a high-fat diet (HFD). Design • The research team obtained 42 fertile, male, Swiss albino mice, weighing 20 g each, and housed them individually in an approved small-animal facility, in a pathogen-free environment. The team generated DIO mice by feeding them a HFD. Setting • The study took place at the Birla Institute of Technology and Science (BITS) in Pilani, India. Intervention • The research team fed all mice, except those in a control group (ND), a HFD for 10 weeks beginning at 7 weeks of age, supplementing the HFDs with herbal treatments for 4 of the groups. The team divided the mice into six weight-matched groups of seven mice each: (1) normal diet (ND), (2) high-fat diet (HFD), (3) triphala (HFD+T), (4) amalaki (HFD+A), (5) haritaki (HFD+H), and (6) bibhitaki (HFD+B). Outcome Measures • The research team evaluated daily energy intake, fasting plasma glucose, serum lipid profile, and liver cytology. The team measured food and energy intake daily for 10 weeks and measured the body weight of each mouse every third day during the course of the experiment. The team drew blood samples at 2, 4, 8, and 10 weeks posttreatment and determined fasting plasma-glucose concentrations and fasting plasma concentrations of cholesterol, triglycerides (TG), LDL, HDL, and plasma alanine transaminase (ALT) using commercial kits. At the completion of the study, a pathologist examined the livers and diagnosed a fatty liver based on the presence of mac-rovesicular or microvesicular fat in the hepatocytes. Results • The research team's results showed that mice fed a HFD for a 10-week period, supplemented with herbal preparation(s) of triphala or its constituents, resulted in significant reductions in body weight (P<.0001), energy intake, and percentage of body fat (P<.001), as compared with mice in the HFD group. Herbal treatment significantly improved the lipid profiles of the mice by lowering serum total cholesterol (Total-C), TG, and low-density lipoprotein cholesterol (LDL-C) and increasing levels of high-density lipoprotein cholesterol (HDL-C) as compared to the mice in the HFD group. The research team also found that herbal treatment attenuated glucose levels, oral glucose tolerance as measured by the oral glucose tolerance test (OGTT), and levels of ALT. In addition to treatment with its three individual components, treatment with a popular Ayurvedic formulation of triphala also reversed the pathological changes in liver tissue and decreased the relative weight of visceral adipose fat pads. Conclusions: The present findings suggest that triphala and its constituents can counter the effects of an environment (ie, high dietary intake of fats) and have the potential for use as antiobesity agents with desirable lipid-profile modulating properties. Embelia ribes has been used as a folk medicine whole world. An aqueous extract of Embelia ribes have visceral fat accumulation and improved insulin resistance in rat model with HFD induced obesity may possibly be through down regulation of leptin, TNF-α, SREBP1γ, and PPARγ2 gene expression. The leptin might contribute to hepatic steatosis by promoting insulin resistance and also by altering insulin signaling in hepatocytes, which consequently promote increased intracellular fatty acid. Hence, drug treatment to rats with HFD prevents increase of these levels due to decrease of the body fat content. Therefore we investigated the anti-obesity effects of the aqueous extract of Embelia ribes by feeding a high-fat diet to rats for 42 weeks. Body weights at 2-6 weeks and parametrial adipose tissue weights were significantly lower in rat fed the high-fat diet containing aqueous extract of Embelia ribes than in the controls fed the high-fat diet. Result: Our data suggest that the antiobesity effects of aqueous extract of Embelia ribes in rat fed a high-fat diet may be through down regulation of leptin, TNF-α, SREBP1γ, and PPARγ2 gene expression. 5. Triphala and Its Constituents Ameliorate Visceral Adiposit y From a High-fat Diet in Mice With Diet-induced Obesity. MODERN RESEARCH STUDIES CONDUCTED ON LOBES INGREDIENTS CAN BE FOUND AT THE FOLLOWING LINKS.